This delightfully thorough post at By Common Consent today about a Young Women stake activity that taught the girls basic coding skills brought to my mind a question I've received numerous times over the past few months. I'm presenting here just one iteration of the question that I've been asked in various ways and by various people. It comes down to this: What can we do to make our girls' entrance into Young Women as meaningful a rite of passage as the boys' entrance into the Priesthood? Stephanie writes: "I'm in charge of New Beginnings this year in my ward (as personal progress director). We are welcoming two new girls into the YW program. Rather than focusing on the decor and such, I really want this event to be special as these girls enter into the LDS sisterhood. I'd like it to feel as important as when 12 year old boys get ordained to the priesthood. Any ideas that you have come across of how to make New Beginnings fulfill its potential?" How can we make the transition into Young Women a memorable, meaningful and individual rite of passage for our girls, the way this bishop did for these older girls? 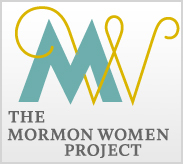 I would love to hear your ideas here and, with your permission, I may share them at the Mormon Women Project's Our Cooperative Ministry site too. Wonder, by R. J. Palacio. Sometimes, I pick up one of the scores if not hundreds of books my daughters traffic in and out of my house. And some days, I'm convinced the great literature of our age comes in the form of young adult novels. I'm not talking Twilight; I'm talking about the only books today that seem interested in exploring what characters and values make a functional life. Daniel Handler, the author (as Lemony Snicket) of The Series of Unfortunate Events, once told the New York Times Book Review, "I am mystified by the appeal of novels showing us the Way We Live Now. I am interested in the Way We Lived Then. I am interested in How Some Other People Live, and I am interested in the Way We Might Live Some Other Time. But most of all I am interested in the Way We Don’t Live Now, a book with the essential strangeness of great literature. The strange illuminates the ordinary. But somebody tell me, please, what the ordinary is supposed to illuminate." I couldn't agree more, and I've read enough adult contemporary literature to know that I only need a small dose of the Way We Live Now. It's too depressing. But how children live, how we all might live if we had the resilience, resourcefulness, hope and imagination of children... that is a book worth reading. And one of those wondrous books is Wonder. Before boys receive the priesthood, they are asked to prepare for it and told that the priesthood comes with new responsibilities to others. To make entering Young Women seem as important as receiving the priesthood and to empower Young Women to take a more active role at church, New Beginnings could include a message to the girls that they have been preparing through baptism and church attendance (or that they can prepare, if they have been inactive) to help build the kingdom of God. Leaders could discuss new responsibilities that come when you are a Young Woman, like helping to plan activities, preparing parts of lessons for the Come Follow Me curriculum, fellowshipping inactive Young Women, and doing more service. The leaders could also explain how the Young Women program can prepare the girls for even greater responsibilities in God's kingdom, like missions, adult callings including visiting teaching, starting a family, and having a career that improves their community. We had our New Beginnings program last month. We centered our decorations, refreshments, music and remarks around this year's Mutual theme (Doc & Cov 4:2) and hit hard on the doctrine about "embark[ing] in the service of God" and serving God "with all your heart, might, mind, and strength", including how *many* different ways there are to serve God. The Young Women ran almost every part of the program - planning the program/decorations/refreshment, conducting the meeting, playing the piano and leading the music, discussing the theme, motto, logo, and short talks on each of the values. Each of the two girls turning 12 was given a personal, special invitation to attend New Beginnings along with her parents. That evening, each was introduced individually to the group by older young women who had gotten to know her and shared some of her special qualities and talents with the group of young women, parents, and leaders. They each received a stack of Young Women "goodies" including posters of the theme, motto, and logo; a Personal Progress book and journal; For the Strength of Youth; True to the Faith; Young Women necklace & bookmark, etc. Our bishop is very good about acknowledging our Young Women in sacrament meeting when they advance to Young Women from Primary, advance classes, and complete their Young Womanhood Recognition - calling them up to the pulpit and spending a few minutes talking about their accomplishments. I am the YW President of a small ward with 5 active YW. This year, we have 4 new girls turning 12, so we wanted to make it special for them. We saw a great idea on Pinterest from thatsumeblog@blogspot.com for a cruise ship themed New Beginnings that we adapted to this year's "Embark" theme. Lori (from thatsumeblog.blogspot.com) was kind enough to send all of her files for posters and tickets. The YW met before the event and planned out each of the stations and we led it like a tour of a cruise ship before it left port. We made our uniforms out of white t-shirts with the Embark logo on the front left pocket and a list of all of the girls on the back (used iron on art transfer paper). I drew from my experience of working with the Primary and the Priesthood Preview, where we had given each of the 11 year old boys a bag with various books and other items that they would need when they turned 12. Each of the new girls received a cruise "bag" with spa towel with the Embark logo, a personal progress book, a mini "Preach my Gospel" book, YW pencils, YW journal, True to the Faith and various other items. Each of our 5 YW had to present at the various stops (we played music from the LDS Youth website in between stops): Port of Faith (The Laurel Pres. and I stood in front of the group with the big old orange life preservers, welcomed the girls and shared the YW themes), Divine Nature Bay (the girls talked about activities and camp), Individual Worth and Knowledge Pier (Personal Progress leader talked about PP), Choice and Accountability Spa (we served refreshments and one of my counselors talked about parental involvement in YW), Isle of Good Works and Club Integrity and Virtue (the Bishop welcomed the girls). At the end, I invited all of our "crew" to stand at the front of the room. I was very proud of the girls and the new girls were very excited to move on from Primary to YW. I am trying hard to prove that YW meetings and programs don't need to look fluffy or as though more time and thought went into the decorations than the messages we share in them. Yes, I like to make things look nice, but I put a strict limit on the amount of time I'll put into those details, because I want the girls to walk away from the event remembering what we said and what they felt rather than what it all looked like or what they ate at the end of the event. To do that I've been trying to better involve the girls of our ward in the planning and in participation of the big events like new beginnings and YW in Excellence. As a presidency we picked the theme (Grow) and then had two girls work together to create the invitations. All of the girls forced bulbs weeks before the event (putting a bulb's roots in water, and setting them out to grow) and in the time leading up to the event we watched them grow in the YW room. We used the bulbs in various stages of growth to decorate for the event. During the evening the current YW presented the various elements of the YW program in unscripted descriptions of each element of the YW (serving in a presidency, participating in camp, working through the personal progress program, etc) and how it provides an opportunity to grow- at each description the girls invited the group to scoop a spoonful of dirt into a cup. At the end the girls each planted a seed, and we told them that the YW program (like the YM program) is designed to create opportunities to grow and progress. The end of the program is not a destination or personal progress achievements are not destinations, but markers of growth and opportunities exercised. Our real goal for them in the program is to grow as a woman and grow closer to God. We are planning to reinforce the message by pulling the theme through the year to our YW in Excellence, talking about Growth again, what the fruits of progress look like (we like to recognize all sorts of the girls' achievements, not just personal progress goals, and more importantly how it makes us feel as we reflect on our growth (as imperfect and gradual and unnoticed as it may seem).